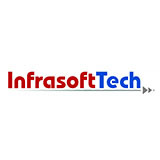 InfrasoftTech headquartered in Mumbai is a specialist software solutions provider for global ﬁnancial enterprises. Founded in 1995, InfrasoftTech in its near two decades journey has helped banks deliver on their various business objectives, be it enhanced customer reach, improved scale & proﬁtability or implementing changing compliance needs. In-house setup: Managing IT setup requires highly skilled and a specialized techie to maintain the setup. In context of in-house data center setup, getting and retaining resources is a challenge, today entire ﬁnancial industry is facing problem of scarcity of right resource and attrition. Cost: Managing & maintaining an In-house datacenter involves massive CAPEX & OPEX overheads. Security: As ﬁnancial institutes operate in a highly regulated environment they are very stringent about sharing their data on the cloud. They can’t aﬀord any loss of their crucial data or customer information. As it can have massive impacts on their reputation & monetary assets. 24*7 support:Financial institutes require a highly reliable and trustworthy cloud environment as it is said, ‘time is money’ even a single minute delay in services or downtime in online applications can result in sizeable losses for ﬁnancial institutes and their clients both. The mobility solution provided by ESDS helped InfrasoftTech’s clients to manage the end to end loan life cycle of their customers on mobile. Powered by integrated modules that can be deployed separately, the solution is made up of modules for customer acquisition, loan servicing, loan operations and delinquency management. ESDS provided its backup services to ensure data backup which can be used in various scenarios like data corruption or if there is a need to restore the data for auditing purpose. Data backup helps in keeping the crucial data/information secured and prevent the organizations from getting panicked during critical situations. InfrasoftTech banks are backed up every 15 minutes as per their requirements giving them and their client’s complete peace of mind. The solutions oﬀered by ESDS such as Mobility solutions, Disaster recovery/backup and many others helped InfrasoftTech team to concentrate on their core business while the entire IT infrastructure was managed by ESDS’ team. Hence InfrasoftTech team dint have to incur any capital expenditure on infrastructures or hardware which helped their IT & other department to focus on their core activities and relieving them from the stress of managing an in house cloud environment.